The unsettling 'gang stalking' conspiracy theory is making headlines in Canada by way of two stories which appear to be unrelated yet are both quite strange. In the first instance, an advocacy group aimed at educating the public about what they see as 'targeted harassment' by clandestine government agencies purchased a number of ads on the Vancouver transit system. The campaign is pretty comprehensive as it features posters in five different railways stops and, amazingly, a message emblazoned on both sides of a train. Oddly enough, the chilling advertisements, which feature the face of a crying woman and the words "victims of organized stalking and electronic assaults suffer in silence," apparently only caught the attention of local media this week. As one can imagine, the coverage largely served to debunk the conspiracy theory by interviewing mental health professionals who insist that those who suspect that they are 'targeted individuals' are simply suffering from delusional beliefs. As to why the Vancouver transit system would agree to run the ads in the first place, the answer is that they are a public agency and, thus, legally bound to "accept advocacy advertising." Meanwhile, a little over 1,000 miles away in the Saskatchewan capital city of Regina, it seems that someone else is sounding the alarm about the gang stalking phenomenon. Earlier this week, messages about the conspiracy theory were spray painted with rather sizeable letters at six different sites throughout the city, including at the headquarters of a number of media outlets. Those particular targets proved to be somewhat clever in that, in at least one instance, they led to the crimes receiving coverage in the news and, in turn, having the conspiracy theory explained to the public, albeit couched as a mental health issue once again. While the time between the Vancouver ad campaign starting and the Regina spray painting would certainly allow for a connection between the two stories, the drastically different way in which each attempt to reach the public was executed suggests that is probably not the case. Why interest in the gang stalking conspiracy appears to have blossomed Canada, of all places, is anyone's guess, although it's worth noting that there was also a bizarre incident earlier this summer in Texas which also revolved around 'raising awareness' of the targeted individual phenomenon. Couple of clips showing media reporting on CSIS illegal activities wich is spying on citizens. Neurophone combined with hypnosis you can make the mind experience and see anything you can imagine good or bad. look at the sharia law finger at the end of it ...wow. Interviewing Targeted Individuals! 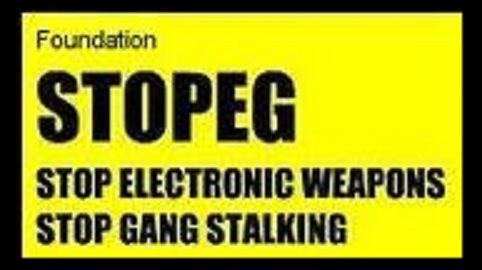 Gang Stalking! UN Agenda 21 being implemented in Canada. The Holy ones are Targeted, Gang Stalkers and Human Decoys! Criminal Harassment by the Canadian Government. Former Gang Stalking Private Security Spills on Program! Canada Laws Against Gangstalking & Harassment.